Gil Cohen has had a long career as an artist, illustrator, teacher and historical painter. Cohen, having studied under renowned illustrator and author, Henry C. Pitz and World War II combat artist, Albert Gold, graduated the Philadelphia Museun School of Art ( now the University of the Arts ) in 1953. Years later, Gil returned there to teach figure drawing, anatomy and illustration from 1966 to 1986, eventually chairing the Continuing Studies Illustration Program. Prior to beginning his art career, Gil spent two years in the army. During that time, he was stationed outside of Frankfurt, West Germany as an artist with the 513th Military Intelligence Group, US Army Europe, during the height of the Cold War. Cohen’s primary career has been that of a freelance illustrator and painter of historical subjects. Clients during this 50 year plus span of time have included: The U.S. Information Agency, The National Park Service, Paramount Pictures, Bantam books, Harlequin Books, Random House, Holt Rinehart & Winston, Warner-Lambert, The U.S. Coast Guard, The National Guard Bureau, and Boeing & Sikorsky Aircraft Companies. Gil Cohen’s passionate interest in aviation started as a youngster during the Second World War. Gil became quite proficient at identifying the many types of aircraft that flew over the Philadelphia area where he was born and raised. Many years later he was able to blend three of his deep interests ( painting, history and aviation ) and would go on to produce his stunning series of paintings depicting scenes of Eighth Air Force activities during World War II. Gil’s emphasis in this series was not only to depict a specific moment in history, as well as actual aircraft, but most importantly, the human element; i.e., human task at hand, emotions being experienced and energy released. The original oil paintings of the series based upon the Eighth U.S. Army Air Force during World War II are in private collections around the world. Limited Edition reproductions of this series are marketed worldwide; some of which are sold out and are only available on the secondary market. A one-man show of Gil Cohen’s Aviation paintings, including the well known Eighth Air Force series, was exhibited at the Mighty Eighth Air Force Heritage Museum in Savannah, Georgia from December, 1988 through May, 1999. Cohen, Artist Fellow, former Vice-President and former Exhibition Committee Chair of the American Society of Aviation Artists ( ASAA ), is currently filling the Ren Wicks Founder’s Chair of ASAA. Cohen is a four time winner of “The Award of Distinction” of ASAA juried exhibitions as well as the ASAA Service Award in 2007. 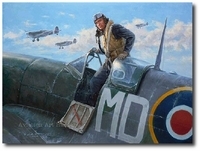 He is also the recipient of the British Guild of Aviation Artists “Best of Show” by an American artist and the “Best of the Best” award sponsored by Aviation Week & Space Technology Magazine. Cohen has conducted artist’s workshops on the topic, “The Human Figure in Pictorial Composition” for ASAA. Gil Cohen’s paintings have been exhibited at the New York Society of Illustrators, The National Parks Civil War battlefield sites of Appomattox Court House, Gettysburg, Mannasas, Chickamauga, and Petersburg, The Kosciuszko Museum and The Art Alliance in Philadelphia, The Kennedy Center in Washington,D.C., The Colorado Springs Fine Art Center, The Royal Air Force Museum in London, The U.S. Air Force Museum in Dayton, as well as the Mighty Eighth Air Force Heritage Museum. For several years Cohen served on the Board of Directors of the New York based Society of Illustrators chairing the Government Services Program which oversaw the Air Force Art Program. In that role he had sent many artists around the world to depict the mission of the U.S. Air Force. His own travels with the Air Force have taken him to such places as war-torn Bosnia, Somalia, Central Asia and Israel. Paintings generated from these trips are donated to the U.S. Air Force Art Program. A painting by Cohen, depicting the airlift of military supplies to Israel from the United States during the Yom Kippur War of 1973, was presented at the Dover Air Force Base Museum during ceremonies in October 1998, commemorating the twenty-fifth anniversary of the Yom Kippur War. In July 2005, a reception of Cohen’s aviation prints was held at the Duxford Flying Legends Air Show in England. Guests signing Cohen’s prints included 22 WW II veterans of the Royal Air Force. Another Duxford reception was held the following year featuring RAF Pathfinder veterans and former members of the famous Eagle Squadron. In 2007 Cohen was honored with the prestigous Lifetime Achievement Award in Art from the Central Bucks County Chamber of Commerce. Gil Cohen’s studio is located in the home he shares with his wife, Alice, in historic Doylestown, Bucks County, Pennsylvania. "Fourth Mission of the Day"
"The Mighty Eighth - Russian Shuttle"
"On the Deck Over Scotland"
"Ploesti: The Odyssey of Utah Man"
"Return to the Bump / Biggin Hill, Summer 1940"